The Coys! : We Got Our Keys! 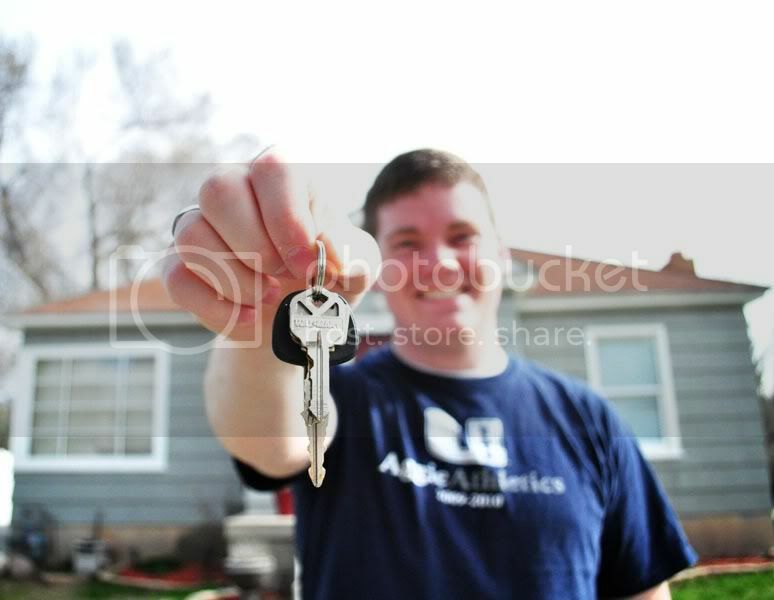 We got the keys to our house on Saturday! I picked them up from our realtor around 11 thirty and was so tempted to go in and check out our house, but I waited for Tyler to get off work until going in. And I'm so glad I did. Buying your first house is a big deal. We are so happy to be in this stage of life and we love the house we bought. 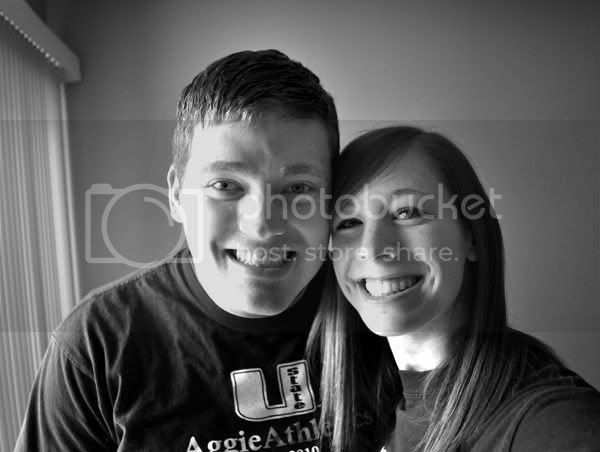 Here's the first picture of us in our new house. We were most excited to get the keys so that we could start painting and hopefully have it all done by the time we move in next week. We picked up some paint and called over our bestest friends in the whole wide world (they'd have to be to want to help us paint) and set out for a fun night. By the way, don't be scared by the darker yellow I'm painting, we're going to tone it down a lot. 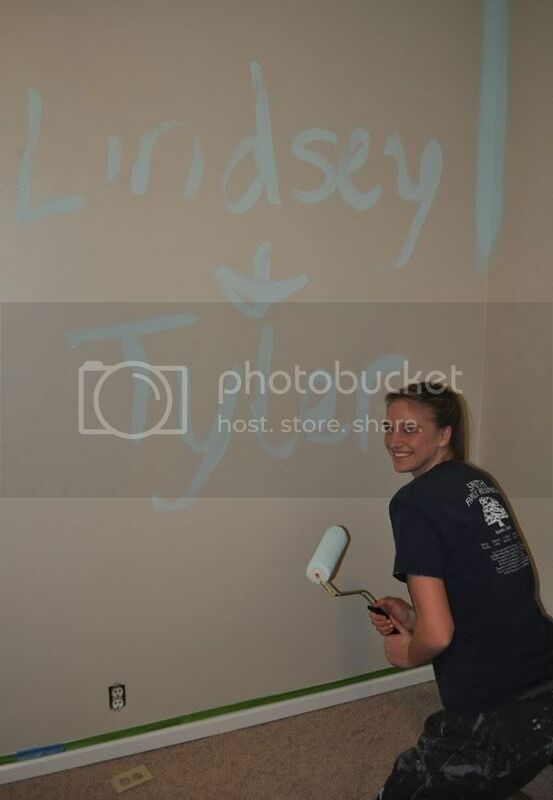 Natalie painted our names on the bedroom wall. So cute! Which of course led to cute pictures and a paint fight. What's painting without a paint fight. You can't call a house a home without a proper paint fight. The paint is turning out really good. We have another coat to do in both rooms but it's looking pretty good so far. We're so excited to own our own home. When we were going through the whole process of making an offer, getting all the paperwork in for the loan and getting remodeling quotes together we kinda got caught up in the tedious and overwhelming details. But this weekend really gave us the chance to realize how important this step is to us. I mean, when you're 10 and someone asks you want you want to accomplish in your life, you say, "I wanna get married, and buy a house, and have kids, and live happily ever after". Well, we have now completed steps 1 and 2. Tyler and I are so happy with where we are in life right now and so happy to share our new home with all our friends. So come visit anytime! so cute! gah! your house is so cute. i'm so happy for you guys. i'm so jealous you can paint! I'm excited to see the finished product! Let us know if you need any help! YAY! YAY! So exciting! I wanna see it! That looks great! I miss you guys!